By depositing an array of tiny, metallic, U-shaped structures onto a dielectric material, a team of researchers in China has created a new artificial surface that can bend and focus electromagnetic waves the same way an antenna does. 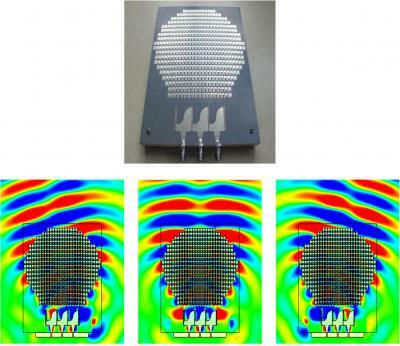 This breakthrough, which the team is calling the first broadband transformation optics metasurface lens, may lead to the creation of new types of antennas that are flat, ultra low-profile or conformal to the shape of curved surfaces. The new work complements the traditional way of constructing Luneburg lenses based on geometric optics -- as well as a second way discovered in the last few years that uses holographic optics.